Ivermectin is one of the most successful anti-parasitic drugs worldwide. 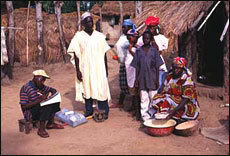 Community-based ivermectin distribution is the basis of onchocerciasis control in the 19 African countries where the disease persists. Click on the photo above to read the story of ivermectin. This feature tells the story of ivermectin: one of the world’s most successful anti-parasitic drugs in veterinary and human medicine. A blockbuster animal health anthelmintic and antiparasitic drug, with global annual sales in excess of $1 billion since the mid-1980s, ivermectin has been donated free of charge since 1987 by its manufacturers, Merck & Co., Inc., to combat River Blindness (and recently Elephantiasis) in people throughout the tropics. The drug is also now being used to treat human strongyloidiasis and scabies. Ivermectin was discovered and developed through a unique international collaboration of public and private sectors. Professor Ōmura and his Kitasato team have been at the heart of the process throughout, and remain dedicated to the search for more compounds from microorganisms that can bring immense benefits to public health worldwide. The ivermectin story includes the world’s first and largest drug donation programme, and the drug is now being used – free of charge – in two global disease elimination programmes that are benefiting billions of the world’s poorest people.